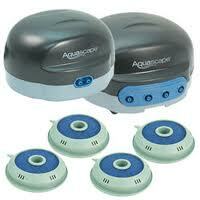 Our Garden Pond Aerators oxygenate your smaller backyard pond for healthier fish and plants. 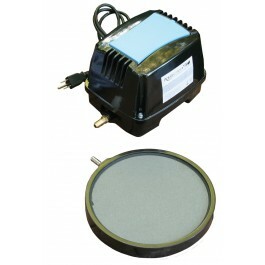 A proper pond aerator is vital to having a healthy koi pond, water garden or lake no matter what time of year it is. Use a pond air pump during hot weather to provide the necessary oxygen. During the winter an air pump will keep an opening in the ice, add oxygen and help gas off toxins. Any system will benefit from adding an aerator. 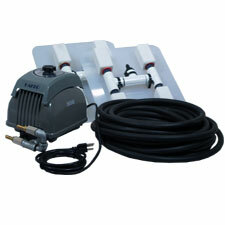 An air pump will also help the growth rate of your fish, both koi and goldfish. Adding an aerator will also help the biological process within your pond. Biological filtration requires large amounts of oxygen so pond air pumps should be used. Oxygen in ponds comes from two sources--photosynthesis and diffusion from the air. The most important source, photosynthesis, is the process plants use for manufacturing food. In the presence of sunlight, plants (especially algae) add oxygen to water as a by-product of photosynthesis. At night, no oxygen is produced, but respiration of algae, fish and bacteria continues to remove oxygen from the water. Most of the time there is a desirable balance between how much oxygen is produced and how much is used, but under some conditions, the balance can be upset, and the oxygen concentration becomes low enough to stress or kill fish. 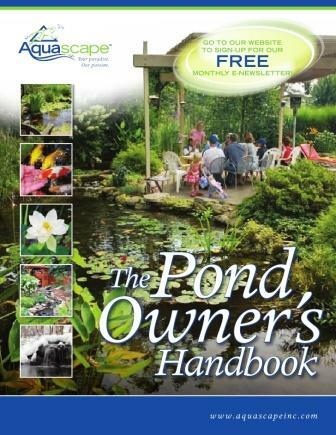 The amount of oxygen in pond water can vary considerably from pond to pond and from hour to hour. Typically, however, oxygen concentrations are lowest at dawn and highest during late afternoon. Respiration rates of both plants and fish increase with the warmer water, so more oxygen is used. 61000 Aquascape professional-grade aeration system is designed to help improve water circulation and increase oxygen throughout the pond.